Gone are the days of carrying two phones- one for work and one for personal. Users and employers are finding that it really is possible for employees to use one device for work and personal use. Studies have shown enhanced productivity, streamlined availability and increased user satisfaction. On the employer side, benefits include reduced equipment cost and a potential decreased IT staff burden (since the employee maintains their own equipment). But how do you balance the benefits and risks of managing mobile devices? A whole slew of questions presents itself when a adopting a device strategy. What if a phone, with company information, is stolen or lost? How is the company is protected from mobile-borne threats? How will these devices impact our wireless network? What devices can be supported? What if users change their phones or tablets? And don’t get us started on security… Most experts agree that tablets and smartphones are arguably less secure than traditional computers, as they lack pre-installed malware protection. Most users or employers are on their own to search for and install mobile endpoint security management. This vulnerability has not escaped the attention of hackers, who unleash creative new threats like SMS text messaged-based attacks on a daily basis. This newer area of cybercrime includes more sophisticated Trojans, keyloggers, phishing attacks and malicious apps. So how do you get your employees to become comfortable with the balance between the employer needing control and the end user desire for freedom? This needs an approach for both corporate owned devices with allowed personal use OR personal owned devices with allowed corporate use. Many analysts say the best practice is for employers to control only the functions that are essential to protect the company and empower end users with the freedom to use the device for wider business and personal tasks – as long as there is no material impact on corporate resources. 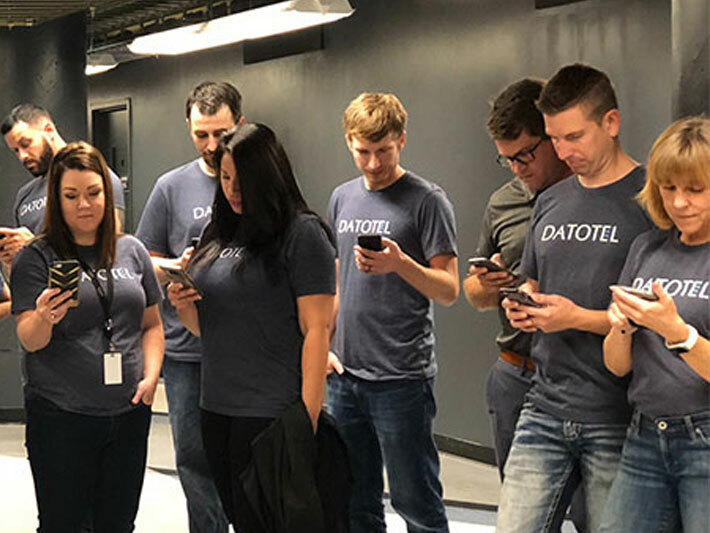 At Datotel we’re helping protect our client’s corporate networks and data through our MDM solution. So whether your team is using their mobile devices to review corporate documents, take photographs of a job sites or simply reading their email; we’d be happy to talk with you further about how our MDM solution may be able to help you.